I'm a-tell you other potables to steal in short order. But I wanted to start with a steal among steals. Today I swung past my local indie liquor store hoping to find some something unusual. 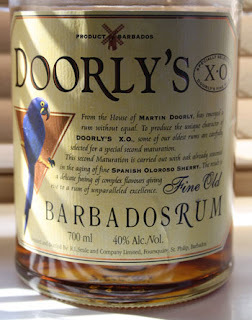 I found Doorly’s XO, a Barbados rum from R. L. Seale. I paid $19. 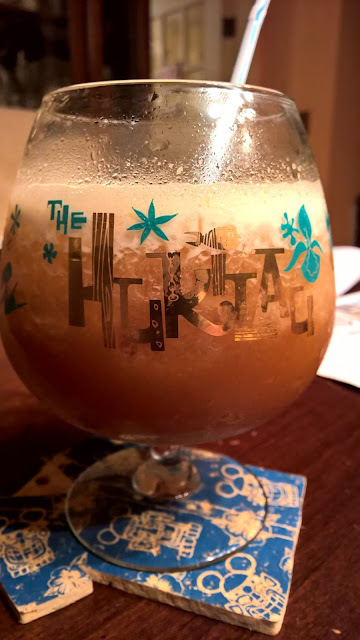 When I first started looking for cool and unusual rums to sample, I ran across an article by Beachbum Berry in the 2011 Hukilau program. Doorly’s XO was given prominent notice and as a steal of a rum. As mentioned, Doorly’s XO is made in Barbados, home to Mount Gay Distilleries and several other rum makers. Doorly’s is blended and bottled by R. L. Seale and Company, who make a number of rums with the Doorly name and have recently begun making the rum for Tommy Bahama, too. From the house of Martin Doorly has emerged a rum without equal. To produce the unique character of Doorly’s X.O., some of the oldest rums are carefully selected for a special second maturation. The second Maturation is carried out with the oak already seasoned in the aging of the Spanish Oloroso Sherry. The result is a delicate fusing of complex flavours giving rise to a rum of unparalleled excellence. If you know Scotch like Balvenie or even kilobuck rums like Dos Maderas, then this may ring a bell. 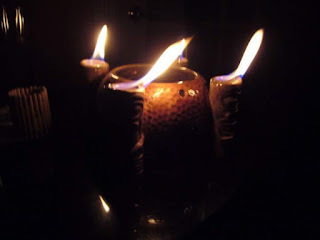 The rum is a beautiful golden brown, and swirling it in the glass reveals very lengthy legs. The initial "nosing" is sweet, with banana and vanilla notes, but not in an artificial way. At first taste, you'll definitely note the sherry and cask, some nuttiness, but still not too sweet at all. By the scent alone, you'd think it was a lot sweeter than it is. It’s smooth, with minimal bite that fades fast. The finish is not especially bold, with a long, modest burn that reminds me of Cognac. A light aftertaste, of sherry and oak barrels, lingers a good while. My initial thoughts are that this would probably pair very well with a mild cigar. Sometimes there are more flavo(u)rs hiding in a bottle, subtleties you can’t just discern right off. These emerge with a bit of water and/or breathing. Just a spot of water, 5:1 with rum, and 5 minutes to breathe. The water and breathing time has brought the sweetness down, smellwise, and the nuttiness up. A sip now is very smooth, with a much tamer burn and longer finish (with a hint of sweetness near the finish of the finish). Overall I Doorly’s XO to be a great sipping rum, and worth the retail price of about $35. The aroma is great, the taste is great, only the burn comes as "acceptable," and it lingers on the palate long after the swallow. Mr. Buxom would love this! I'll have to see whether I can find him a bottle for Christmas. Thanks! If I get to go to Poppyville next month, we might be able to do a hostage exchange if you can find say, at Binny's or Sam's a bottle of Lemon (which was a guy's name, nothing to do with Lemons) Hart 151 Demerara Rum. Put on your scout outfit and let me know!